Oh my dear bees. I have been a little absent lately for two reasons. One, because not a whole lot has been going on that is post-worthy in wedding planning, and two, because I have been very busy planning another event. Now, before I jump into all of the gory details with you all I must preface this post with a disclaimer. I definitely considered not sharing this part of our wedding journey with the blog because Stag and Doe* parties are not a widespread wedding practice and I have read criticisms in the past. That being said, they are very popular in some areas of Ontario and Manitoba (particularly in small towns where there aren't a lot of things to do). Until I entered the wedding world, I had no idea they weren't done everywhere! When it came to planning our wedding, we discussed not having a one, but there was a lot of support and encouragement (perhaps even some "You have to's!") for us to throw one, and they are oh so much fun! We all have different traditions depending on where we live (cash bars, dollar dances, for example), so my disclaimer for my series of posts on our Stag and Doe are to keep things kind. First things first, what exactly is a Stag and Doe? Stag and Doe's are a party hosted by the wedding party, family and couple before their wedding for the purpose of raising money for the wedding. When you write it out like that, it's certainly cringe worthy. I get it. But the reason why I decided to share this part of the journey with you all, is to attempt to give them a better name on the interwebs and perhaps one day help someone out in their planning. Sure they're a take it or leave it party, but for the partying crowd, they're a blast. And, well, we like to party. The party is more so a community event, open to friends and family, and friends of friends and friends of those friends. It's not a wedding guest only event. It's a party where you can drink for very cheap (much less than a night out at the bar), play fun games, and win some pretty amazing prizes. I would put it in the realms of engagement party. In Thunder Bay (where Mr. Narwhal is from), they're so popular that complete strangers will show up just to have a good time and win some cool prizes. They really vary depending on where you live. When it came to planning our Stag and Doe I really came up pretty dry in the research. There are several sites with some advice on how to throw one and popular games, but most of what we found was mildly helpful. We have relied on past events we and our wedding party have attended and/or planned for the "how to". Our Stag and Doe was this past weekend, and I have been moved to tears several times leading up to this event, during and after. Both of our hearts are so incredibly full from the love, support and more support we were showed this past weekend. It was clear that our guests were in it for more than just an inexpensive night out, our friends, family and community showed us more support and love than we could have ever anticipated. The amount of people that came up to us on Saturday, and the messages we have received since thanking us for such an amazing event is enough to make my heart burst. It's a wonder I'm still standing. I actually ran into one of my mom's employees a few days later and she thanked me endlessly for such an amazing night, and when I told her that I was the one that was so thankful, she said, "It was just exactly what everyone needed - a great night out." Our priority was to make this a fun and worthwhile event for everyone attending, so we went about our planning a bit differently than usual, and I think this is why it was so well received. Instead of putting in a minimal effort, we cautiously and carefully planned out every aspect of the event (and spent a great deal of money upfront ourselves) to ensure that our guests had a great time, as well as hopefully making a profit for ourselves.We also decided in the week leading up to the event that it was important to us that we pay forward a portion of what we made (roughly 5%) to a local charity. Today I'm going to give a breakdown of all of the steps we took to plan the Stag and Doe, and in my next post I will give a recap of how the night went. Spoiler alert: it was perfectly perfect. While lengthy, my hope is that the details will be helpful to someone in the future. Instead of having many posts on the topic, I'm going to try and keep it to two, recognizing these posts will only be beneficial for a small audience! In preparing for our own Stag and Doe we started with a date and searched for a venue. After polling our wedding party, we had a clear winner for the end of April, and I set out to find a venue that would work for us. There are several venues in Huntsville that are regularly used for Stag and Doe's, but you need to be careful to find one that will allow you to serve your own alcohol versus having to hire a bartender and serve their liquor. We landed on Port Sydney Hall, with a capacity of around 200 people, which included a full kitchen, tables and chairs in our rental. We also had to pay a fee to the venue for insurance and obtain a liquor license from the Liquor Control Board of Ontario (LCBO). Step two: Figure out how you're going to structure the night. Beyond the basics, you're left with a blank slate of how you would like to run your event. There are certainly a few classic games** at Stag and Doe's to include, but the possibilities are endless. BM Click has been to four Stag and Doe's during this season, and my parents have attended one, all in the city. We used their experiences as a learning opportunity for things that would be important for us to include in the event. One thing that was very important to Mr. Narwhal and I in the planning process was that drinks would be affordable, prizes would be well worth the attendance and more than anything we wanted it to be fun! We weren't obsessive over how much money we could make, but wanted to be able to cover our costs and make enough of a profit to make the time spent planning the event worthwhile. 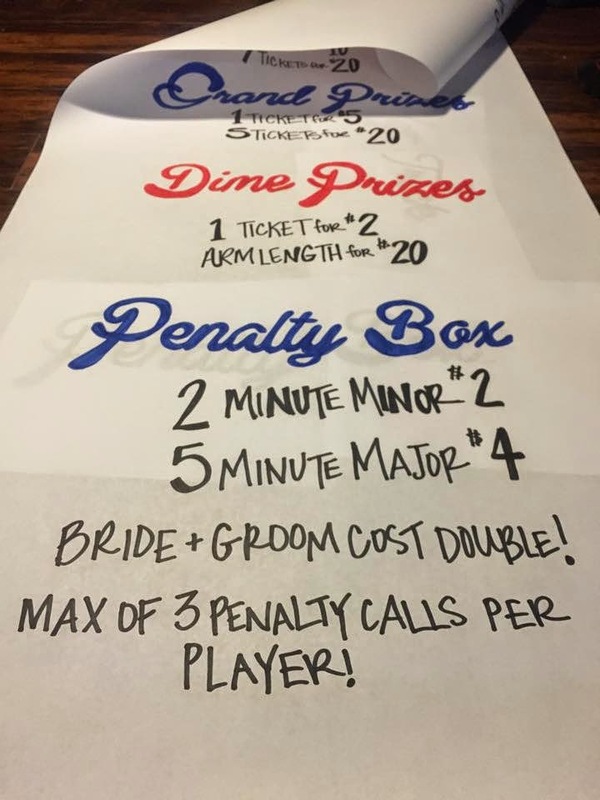 Based on the feedback from our wedding party and parents attendance at other Stag and Doe's, we decided to offer three all night games, one limited time game (the Toonie*** Toss), a penalty box, a pie in the face competition, a grand prize table, what we called "dime prize" (i.e., smaller prizes) table and a door prize table. There are several income streams for the event. Ticket sales: We decided on $10 in advance, $12 at the door. Admission tickets enter guests into door prizes. These include the smaller prizes that were donated to us (e.g., alcohol promo/swag items, coffee, etc.) and were pulled at random throughout the night. Prize tickets: Tickets were available for grand prizes $5 each or 5 for $20 and the dime prizes $2 each or an arms length for $20. I purchased way too many tickets. Drink tickets: Drinks were purchased through ticket sales, at $4 each, 3 for $10 or 7 for $20. Penalty box: We also had a hockey penalty box as a nod to Mr. Narwhal's role of a coach. People could pay money for people to put in the box for either 2 or 5 minute penalties. We charged $2 for a minor 2 minute penalty or $4 for a major 5 minute penalty. Mr. Narwhal and I costed double. Pie in the face Competition: By the bar, there were two jars place to "save" either the bride or the groom from a pie in the face at the end of the evening. Whoever raised the most money gets to put a pie in the face of the other. Bundles: We also put together bundle packages that included drink tickets and prize tickets. Toonie Toss: In the middle of the evening we held a "Toonie Toss" to win a large prize, where the closest toonie wins the prize. Our wedding party took charge of ticket sales, and were wildly successful. We pre-sold in the realm of 100 tickets, and around 20+ tickets that were donated from those unable to attend. Most of the sales, and information for the event were shared on a Facebook event that the wedding party created. Being from a small town, most people know and have connections to many small businesses in town, and the wedding party was able to get a huge amount of donated prizes from local businesses, and Mr. Narwhal and I purchased two grand prizes and a few of the smaller prizes to add to the pool**. This includes all of the alcohol, drink mix, food, supplies and decorations. We offered rum, vodka, whiskey, red wine, white wine, two kinds of beer, Jagermeister and Jello shooters. Our house was taken over by prizes and alcohol in the days leading up to the event. We planned to have lots of food (probably too much), including three kinds of meatballs, chicken nuggets, bruschetta flat bread, veggies, soup and your regular variety of munching snacks. After all of the set-up, it was time to open the doors and party the night away. In my next post, I'll share how it went in more detail. Have you ever been to a Stag and Doe? *Also referred to as Buck and Doe's, Jack and Jills, Shag's and Socials depending on where you're from. ** More details in my next post.